Several 40ft Seaplane Tenders were sent to South Africa during WW2. Of these boats, ST’s 430, 433, 1537, 1572 and 1580—only ST-433 is assumed to have survived and no other records are available as to the whereabouts or fate of the other four Tenders. ST-433 was extensively altered and was rebuilt twice during her lifetime, first when rotten wood was replaced in her hull and the second time in the 1970’s when major alterations were done and her cabin section totally redesigned and reconstructed. 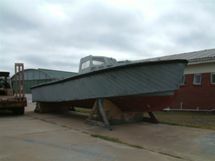 After SAAF service she was laid up in a hangar for many years and was then handed to the SA maritime Museum as an exhibit. 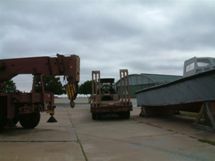 After space became a premium, she was nearly scrapped but was fortunately saved and moved to a static position outside the canteen at SAAF base Langebaanweg where she spent her next couple of years on land being battered and beaten by wind, rain and sun. 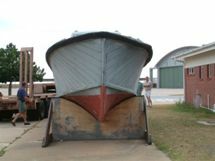 In June 2004, Peter van der Linden the owner of Goose Adventures was contacted by Guy Ellis from the OBT (Old Boat Trust) and informed that ST-433 was going to be destroyed and whether we would be interested in taking her and restoring her for future use as an original Seaplane Tender for our proposed return of a luxury Flying Boat to SA in 2005. 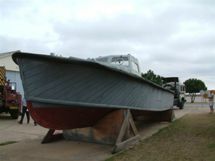 Although not having any interest in boats, Peter accepted the challenge and after extensive research and appealing to many for assistance, his interest grew to a point where he devoted most of his spare time to the saving and restoration of ST-433. With appeals to companies for sponsorship, advice and assistance he finally managed to have the ST moved back to Cape Town where she was housed at the SAAF Ysterplaat Museum for restoration. ST-433 officially arrived back “home” on 20th December 2004 and was made ready for the long hard work that lay ahead to get her back in the water.